With the warm days of summer now fading off into the distance in our rear view mirrors, let’s pay one last tribute to the greens of summer before the frosts come and our outdoor herb gardens give up the ghost for the winter. For our theme for this month, I have chosen: (it’s not easy) “Bein’ Green.” (Perchance due in no small part to my predilection for Green Chartreuse.) I’m giving you a wide berth on this one, anything using a green ingredient is fair play. There’s not only the aforementioned Chartreuse; how about Absinthe Verte, aka the green fairy. Or Midori, that stuff is pretty damn green. Crème de menthe? Why not? Douglas Fir eau de vie? Bring it! Apple schnapps? Uh…well…it is green. I suppose if you want to try to convince me it makes something good you can have at it. But it doesn’t have to be the liquor. Limes are green. So is green tea. Don’t forget the herb garden: mint, basil, cilantro, you name it – all fair game. There’s also the veritable cornucopia from the farmers market: green apples, grapes, peppers, olives, celery, cucumbers…you get the idea. Like I said, wide berth. Base, mixer, and or garnish; if it’s green it’s good. Surprise me. Use at least one, but the more the merrier. The field was literally open to anything. With this in mind I really wanted to make a Japanese Garden from Bar High Five in Tokyo: “a mix of single-malt Nikka 10-year Yoichi whisky (only available in Japan), Midori Melon Liqueur, Suntory Green Tea Liqueur, and a prototype green tea bitters of Hidetsugu’s own creation”. Combine all the ingredients except the Mezcal with ice, shake, and strain into a mescal rinsed cocktail glass. Mescal, Tequila, Pineapple and Green Chartreuse all in one cocktail glass create one big happy family. Rich and silky with a touch of smoke. The next drink is from the Imbibe website. 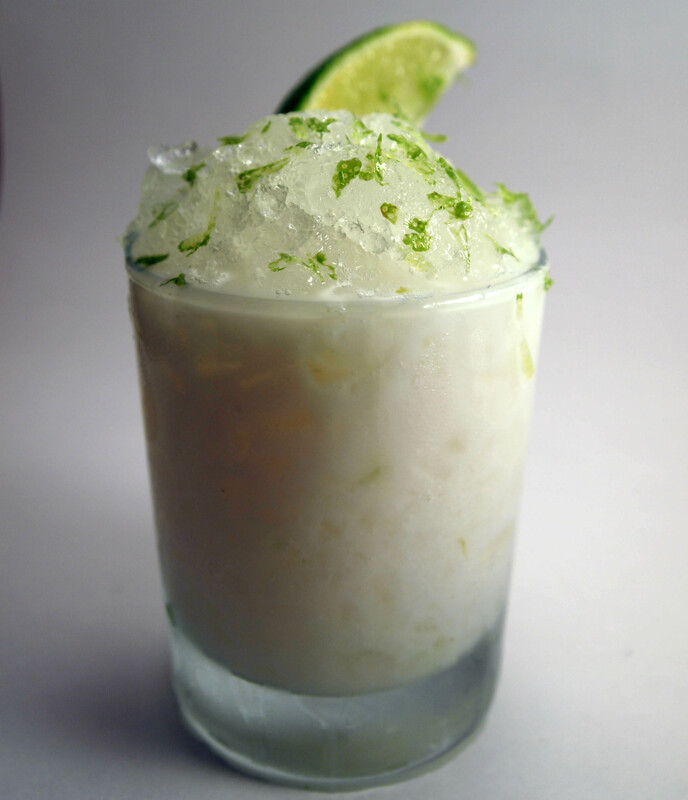 In reality the original recipe, Put the Lime in the Coconut is actually for shaved ice and not a cocktail. Now its time to add some rum. 1.75oz Lemongrass Infused White Rum (Oronoco) per serving. Notes: A refreshing treat that takes you back to the warm days of summer. The lime really cuts through and adds a bright and zesty flavor with the lemongrass adding its soft touches in the background. Please subscribe, follow us on Twitter and Like us on Facebook. Sounds delicious I actually had one of these and it was GrEaT!!! Thanks glad you enjoyed it. Looks and sounds delightful. I think Kermit the Frog would be impressed by your homage to green!